Have you ever wondered if someone actually clicked a link in an email you sent them? Have you ever wanted to be able to track click-throughs on your website without subscribing to one of the more complicated and expensive marketing solutions available? If so, give EZTrack a try! 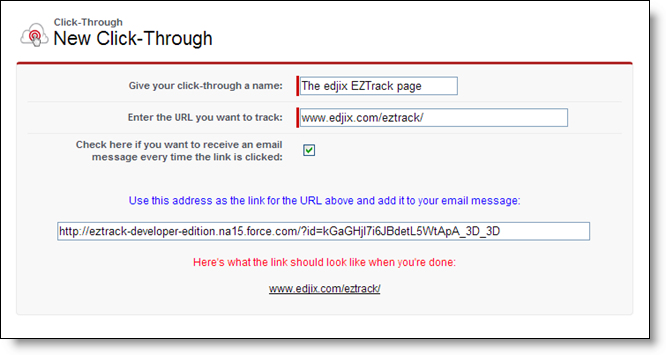 EZTrack is a simple, sensible Salesforce® app that generates an HTML link that you can include in an email message or on a web page to log click-through activity and redirect users to whatever final destination URL you specify. 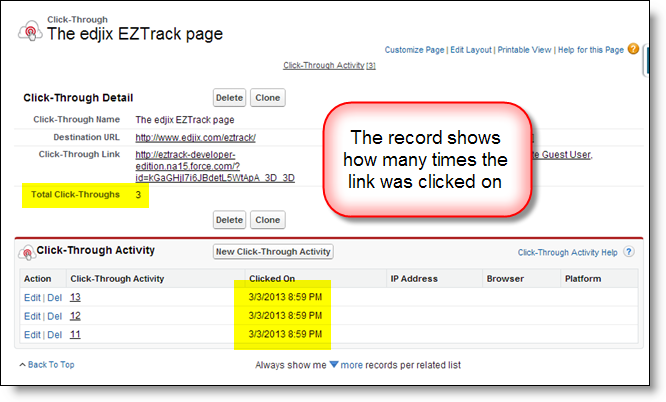 All activity is logged right within your Salesforce® org and EZTrack provides more insight into click-throughs than Salesforce®'s basic (and admittedly imperfect) "email opened" reporting. Click here to download the EZTrack unmanaged package to your Salesforce® org. NOTE: As an unmanaged package, EZTrack is not compatible with Group and Professional editions of Salesforce®.